DESY and MPSD scientists have created high-order harmonics from solids with controlled polarization states, taking advantage of both crystal symmetry and attosecond electronic dynamics. The newly demonstrated technique might find intriguing applications in petahertz electronics and for spectroscopic studies of novel quantum materials. The nonlinear process of high-order harmonic generation (HHG) in gases is one of the cornerstones of attosecond science. An attosecond is a billionth of a billionth of a second) and is widely used in many areas of science, including physics, chemistry and biology. This strong-field phenomenon converts many low-energy photons from an intense laser pulse into a photon of much higher energy. Whereas the HHG process is well understood in atomic and molecular gases, the mechanism underlying frequency conversion in solid materials is currently still the subject of scientific controversy. By combining HHG experiments and state-of-the-art theoretical simulations, scientists from the Deutsches Elektronen-Synchrotron (DESY) and the Max Planck Institute for the Structure and Dynamics of Matter (MPSD) at the Center for Free-Electron Laser Science (CFEL) in Hamburg now introduce polarization-state-resolved high-harmonic spectroscopy of solids, which permits deeper insights into both electronic and structural dynamics occurring on time scales shorter than one oscillation of the light field. Their work is now published in Nature Communications. The emitted harmonic fields can oscillate in a linear fashion, or they can rotate elliptically or circularly with clockwise or anticlockwise handedness (so-called helicity) – just like a screw of light. 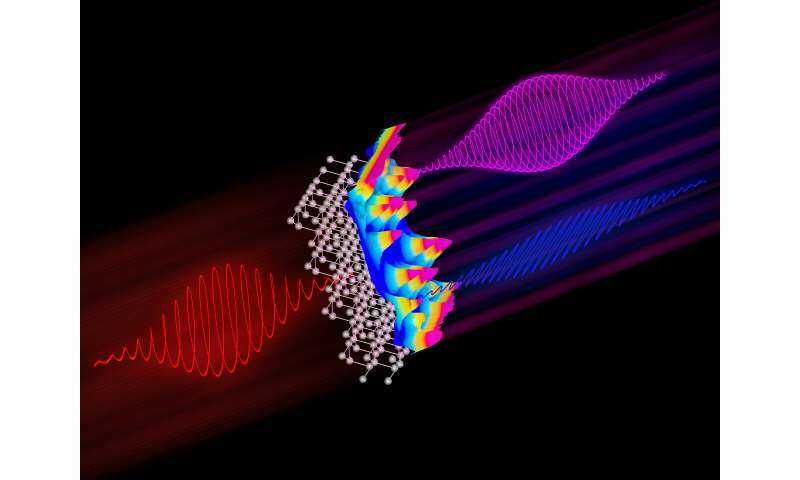 The scientists now reveal how the harmonics' polarization states and their handedness encode valuable information on the crystal structure and ultrafast strong-field dynamics, and how the harmonics' polarization states can be controlled. Moreover, since the harmonics are created within a single period of the incident driving field, the method inherently comes with a sub-optical-cycle temporal resolution. What you did with the title, I see it. Clever little literary pun.